Squirrel is the common name for rodents of the family Sciuridae. In everyday speech in the English-speaking world, it usually refers to tree squirrels, which are members of the genera Sciurus and Tamiasciurus. They are indigenous to Europe, Asia, and the Americas. Similar genera are found in Africa. The Sciuridae family (squirrel family), called sciurids, also includes flying squirrels, and ground squirrels such as the chipmunk, prairie dog, and marmot (including woodchucks). Sciurids are found in all continents except Australia and Antarctica. Squirrels are integral to forest regeneration and food chains and help to keep insects under control. The tree squirrel’s unique habit of burying food for their own survival harmoniously fosters the development of forest from the uneaten nuts and seeds. For humans, squirrels, while historically hunted and trapped for meat and fur, also provide aesthetic pleasure, adding to the human delight in nature, and being featured in books and artwork. They can, however, be destructive to crops and cause electrical outages. The scaly-tailed flying squirrels of Africa are not sciurids, but members of another rodent family, Anomaluridae. Skull of an extinct Oriental giant squirrel. Sciurids, like all rodents, are noted for their teeth. They have a pair of large incisors on the upper and one on the lower jaw that grow continuously and need to be kept short and sharpened by frequent gnawing. (The word "rodent" comes from the Latin word for "gnawing.") The second pair of incisors, the canines, and the first premolars are missing in rodents, creating a gap between the incisors and the grinding teeth. In most squirrels, the incisors are large and the jaw muscles are strong and well developed. Young sciurids are born hairless and helpless. In almost all species, the mother builds a nest to keep the young warm and protected. Sciurids live in a wide range of environments from tropical forests to deserts and mountains. Most eat mainly plant food along with occasional insects and other animal food. A few sciurid species eat mostly insects (Nowak 1986). Most sciurids living in environments with cold winters build warm nests, either underground or in trees, and survive the winter by hibernating or by storing food. Overall, the sciurids have been a very successful family. Many species are now doing well and even expanding their ranges. However, some are endangered due to loss of habitat from human activities (IUCN 2007). Gray squirrel nest also called a "drey"
Tree squirrels, as the name suggests, are arboreal, spending most of their time in trees. Tree squirrels inhabit the forests of Eurasia, North America, and South America. Typical tree squirrels include the European red squirrel (Sciurus vulgaris), the fox squirrel (S. niger), the eastern gray squirrel (S. carolinensis), the western gray squirrel (S. griseus), the Douglas squirrel (Tamiasciurus douglasii), and the American red squirrel (Tamiasciurus hudsonicus). Tree squirrels are medium-sized for rodents, with adults weighing from 150 to 2000 grams (0.3 to 4.4 lbs). They are covered with thick fur, which can vary in color from brown to red to black or even white. The tail is long and also thickly furred and is used for balance, to help slow and control falls and jumps, to provide warmth and shade, to distract predators, and to signal other squirrels (Nowak 1983; Voelker 1986). The word squirrel comes from the Greek words skia ("shadow") and oura ("tail"); in other words, "tail that casts a shadow." Unlike rabbits and most ungulates, such as deer, the digestive systems of squirrels cannot digest cellulose. They must rely on foods rich in protein, carbohydrates, and fat. Tree squirrels are omnivores; they eat a wide variety of plant food, including nuts, seeds, fruits, fungi, and green vegetation, and they also eat insects, eggs, small birds, small mammals, frogs, and carrion. One well-known trait of some species of tree squirrels is the gathering and storing of nuts and seeds for the winter. These squirrels are scatter-hoarders; they will gather nuts and seeds and store them in any accessible hiding place, usually by burying them. This plays a vital role for the forest because a few of the nuts and seeds that are not eaten grow into new trees and the forest is maintained. Squirrels also help the forest by helping to keep the population of potentially harmful insects under control. They are also an important food source for many predators, including owls, fishers, and martens (Caras 1967). For humans, the most important aspect of tree squirrels is their beneficial role in the forest ecosystem. Humans also sometimes trap and hunt squirrels for their meat and fur. Earlier editions of American cookbooks often included recipes for cooked squirrel. In 1970, the value of red squirrel pelts trapped in Canada was about US$1 million (Nowak 1983). Some species of tree squirrel have moved into cities and towns. There they have been very successful, finding ample food and nesting sites and protection from hunters and predators. Many people enjoy the company of tree squirrels and like watching their seemingly cheerful and energetic antics. However they can be pests when they enter buildings to find food or make their nests. Tree squirrels are sometimes pests on farms as well, eating growing crops and stored food. Tree squirrels are often the cause of electricity outages. The animals will enter transformers or capacitors looking for food. Gnawing on the equipment, the squirrels may be electrocuted and cause a power surge that shorts equipment. Squirrels have brought down the high-tech NASDAQ stock market twice and were responsible for a spate of power outages at the University of Alabama. Rubber plates are sometimes used to prevent access to these facilities. 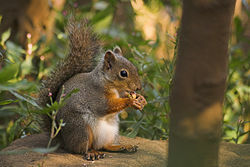 Squirrels will often chew on tree branches to sharpen their teeth, but cannot tell the difference between a tree branch and a live power line, causing disruption of power or even telephone service in the case of telephone lines and connections. Squirrels caused 177 power outages in Lincoln, Nebraska, in 1980, which was 24 percent of all outages. Estimated annual costs were $23,364 for repairs, public relations, and lost revenue. In Omaha, in 1985, squirrels caused 332 power outages costing at least $47,144. Tree squirrels can be trained to be handfed. Because they are able to cache surplus food, they will take as much food as is available. Squirrels living in parks and campuses in cities have learned that humans are typically a ready source of food. Hand feeding is not recommended, however, because squirrels may carry bubonic plague or other animal-borne diseases. Even if they do not carry disease, they often have a hard time telling fingertips from food, and bites are painful. Despite periodic complaints about the animal as a pest, general public opinion towards the animal is favorable, thanks to its appearance and movement and its habit of gathering and storing nuts. 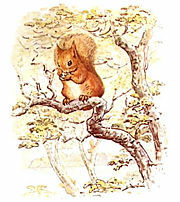 Squirrels are popular characters in cartoons and children's books, such as the works of Beatrix Potter. A pet Southern flying squirrel. The flying squirrels are members of the tribe Pteromyini. There are 43 extant species in this tribe, the largest of which is the woolly flying squirrel (Eupetaurus cinereus) found in the mountains of central Asia. The most well-known to English speakers are the northern flying squirrel (Glaucomys sabrinus) and the southern flying squirrel (Glaucomys volans) of North America, and the Siberian flying squirrel (Pteromys volans) of northern Eurasia. The term "flying" is somewhat of a misnomer, since flying squirrels are actually gliders incapable of true flight. Gliding is achieved by launching off the tops of trees and extending flaps of skin stretched from arms to legs: once they have launched themselves into the air they are highly maneuverable while in flight. Steering is accomplished by adjusting tautness of the skin flaps, largely controlled by a projection of cartilage from the wrist. The tail acts as a stabilizer in flight, much like the tail of a kite, and as an adjunct aerofoil when braking prior to landing on a tree trunk. Chipmunks are members of the genus Tamias. About 23 species fall under this title (currently), with one species in northeastern Asia, one in the eastern portions of Canada and the United States, and the rest native to the western part of North America. These small squirrels (members of Sciuridae) fulfill several important functions in forest ecosystems. Their activities with regards to harvesting and hoarding tree seeds play a crucial role in seedling establishment. They also consume many different kinds of fungi, including those involved in symbiotic mycorrhizal associations with trees. They are an important vector for dispersal of the spores of subterranean sporocarps (truffles), which lack the ability to disperse their spores through the air and depend on chipmunks and other mammals, including pigs. 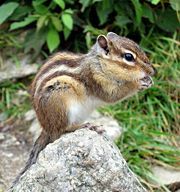 Chipmunks play an important role as prey for various predatory mammals and birds, but are also opportunistic predators themselves, particularly with regard to bird eggs and nestlings. Prairie dogs are members of the genus Cynomys. They are native to the grasslands of western North America. Prairie dogs, like other ground squirrels, dig underground dens for protection from predators and from the weather. The black-tailed prairie dog (C. ludovicianus) was once one of the most common animals on the North American prairie. It lives in social groups, called "towns," which in the past often held millions of animals. Prairie dogs help the grasslands by turning up and adding organic material to the soil, as well as by helping prevent the encroachment of trees and bushes. Prairie dog numbers are now greatly reduced due to extermination by humans in the process of converting the wild prairie to farmland and rangeland. Marmots are members of the genus Marmota. They are the largest members of the Sciuridae family, weighing up to 7.5 kg (16 lbs). Those most often referred to as marmots tend to live in mountainous areas such as the Sierra Nevadas in the United States, the European Alps, and mountainous areas in Asia. One of the most well-known marmots is the groundhog (M. monax). In contrast to the other marmots, it is a lowland creature. It is widely distributed in North America and common in the northeastern and central United States. In the west, it is found only in Alaska, Alberta, British Columbia, and northern Washington. Marmots typically live in burrows, and hibernate there through the winter. Most marmots are highly social, and use loud whistles to communicate with one another, especially when alarmed. The squirrel family is divided into 5 sub-families, 51 genera, and 278 species. Caras, R. A. 1967. North American Mammals. New York: Galahad Books. MacClintock, D., and W. Ferguson. 1970. Squirrels of North America. New York: Van Nostrand Reinhold Company. Steppan, S. J., B. L. Storz, and R. S. Hoffmann. 2004. Nuclear DNA phylogeny of the squirrels (Mammalia: Rodentia) and the evolution of arboreality from c-myc and RAG1. Molecular Phylogenetics and Evolution 30: 703–19. This page was last modified on 19 October 2015, at 20:22.